The color schemes that are available for the Mizuno Wave Prophecy 6 received some praise from many runners. A reviewer commented that the heel section of the upper unit hugged the foot snugly, but it didn’t feel too tight. A lot of testers were able to describe this shoe as ‘comfortable’ for their feet. According to a purchaser, the toe box was roomy enough to allow natural toe-splay. The raised mid-foot platform was able to support those with flat feet, and they stated that it prevented fatigue during those long running sessions. A consumer commented on the padding in the upper unit, noting that it provided some cushioning as it hugged the foot. The mid-sole in this shoe gained the favor of several runners because for them, it was responsive and reliable. Many purchasers noted that the 6th version of the Prophecy was better in quality and construction than its predecessors. The general width and length of the shoe seemed a bit narrow for a few testers. According to a reviewer, the mid-sole unit tore apart after only 3 weeks of use. The toe box seemed to be narrow, according to a consumer; she felt numbness in the toes because of it. It was half-a-size smaller than what some runners were used to. The general response for the Mizuno Wave Prophecy 6 was positive. Most of those who have tested it have welcomed its appealing looks, its comfortable underfoot platform and its secure upper coverage. According to them, it’s a solid option for road running. But for some, it was narrow in the forefoot area; sizing was also inconsistent for others. I was recently given the opportunity to try RunRepeat. I was really excited to test these out and testing is what I did. 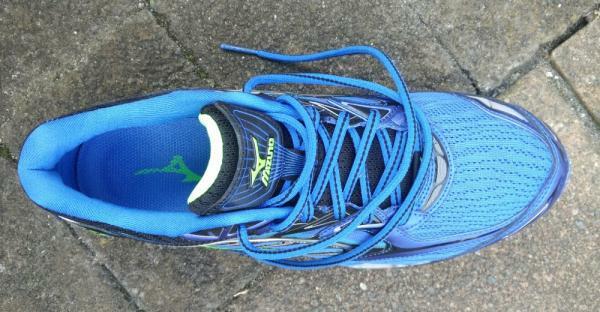 Here's my review of the Mizuno Wave Prophecy 6 after running more than 60 miles on these over a month. By the time I picked up these shoes for the first time, the upper materials and the looks just jumped on me. The shoe looks absolutely gorgeous! The blue upper had plenty of materials layered over each other. The base layer is made from a mesh-like material that gives you decent breathability around your toebox. There is then a leather overlay that's stitched and not moulded. I personally prefer the seamless construction of many shoes that are available in the market. On top of the leather, we have a plastic overlay on the sides that help clutch the shoes to your ankle. All these overlays contribute significantly towards the weight of the shoe. These shoes are also quite bright by reflecting light during your runs at nights. Overall, the shoes are quite pleasing to the eye. I personally felt the shoes were a little tight for my liking and had to stay wary while tightening the laces too much. In saying that, the lace provided with the shoes are possibly the best I've seen for a long time! Once tied, they are very hard to untie and maintains a great hold during your runs. The toe box also felt a little narrow for my liking. After running in the Wave Prophecy 6 after the 6-8kms my feet started hurting badly around my toe box. In the heel section, the heel counter had ample cushioning. The heel cup is made of solid plastic that is quite solid in that aspect. The tongue also had quite a bit of cushioning. Coming to the midsole, this is where Mizuno has put all their money in. The midsole is essentially 2 plastic "wave plates" held together all along the length of the midsole. The engineering principle behind this is that when the shoe strikes the ground, the waves compress and then expand on the toe off providing the cushioning and energy return. In theory, it's good but it didn't necessarily translate into performance for me. The wave plates felt too rigid in my opinion during my running cadence. Between the upper and the top waveplate, Mizuno has filled the gap with the u4ic (pronounced Euphoric) Eva. The EVA foam doesn't help here in my opinion. Perhaps it might really be helpful for someone who's a bit heavier than me in my 75kgs. Also, the heel to toe drop here is around 12mm which was a little too much for me. My running cadence felt slightly unnatural in these shoes. The wave plates may sometimes force you to adapt to a springy cadence to extract some responsiveness. The outsole was, fortunately, very durable. I found very slight wear on the outsole, thanks to Mizuno's x10 carbon used along with the rubber. The rubber is not throughout the bottom of the shoe like some of the New Balance fresh foam lineup. Instead, Mizuno has strategically placed the rubber outsole on areas of high wear. On the arch region, the wave plate is exposed to provide some stability for people who overpronate. There's also ample rubber on the forefoot which is where I land on striking. They've given some contrasting accents for visual appeal. Colors – Very visually appealing & will make heads turn when you're on the road. Very durable upper and outsole. Snug fit on the upper. Waveplate based cushioning was a miss for me. Unnatural cadence due to high heel-to-toe drop. Too heavy. Certainly not for racing. The Mizuno Wave Prophecy 6 is a running shoe that’s made for those with neutral foot pronation. It makes use of proprietary materials in order to provide a comfortable and well-rounded running experience for the wearer. Visually, it has a stand-out design that’s typical of the brand, with sharp textures, eye-catching color schemes, and wavelike shapes that represent the sole unit. The upper unit of this running shoe features a breathable mesh material. Serving as the main cover system, it responsibly keeps the foot in a secure wrap, while also accommodating air into the foot-chamber. The upper is also constructed to allow the runner to move naturally without being restricted. It follows the natural shape and motion of the foot throughout the running experience. The Mizuno Wave Prophecy 6’s mid-sole unit has technologies that run its entire length. A lightweight yet responsive foam material responsibly cushions each footfall and facilitates energized toe-offs; the soft U4icX Strobel Layer underneath the cushioned sock liner brings more comfort; and a full-length wave plate makes the ride smoother and more enabled. Protecting the unique cushioning platform of this running shoe is the X10™, which is a durable rubber material. It lengthens the overall lifespan of the sole unit by staving off the abrasive nature of the asphalt. It is also the one that delivers traction. Regular sizing schemes were used in the making of the Mizuno Wave Prophecy 6. The available width for both the men and women’s versions is medium. It is meant for the runners who have medium sized feet. Its semi-curved shape mimics the natural curvature of the human foot. The X10 is made up of durable carbon rubber. It protects the rest of the Mizuno Wave Prophecy 6’s cushioning system from the abrasive nature of the roads. It doesn’t peel off or wear off easily, as well. It is also the one responsible for providing traction to the runner, thus ensuring confident control over the surfaces. This outsole unit is widely used in popular Mizuno shoes like the Wave Prophecy 8 and Wave Inspire 15. The SmoothRide engineering utilizes flex grooves, which allow the platform to evoke a rocking-chair-like motion when taking each step. Such a design smoothens the foot-strikes and energizes the toe-offs. The U4ic is a cushioning technology that runs the entire length of the mid-sole. It provides responsive support to the foot of the wearer. It’s also made to last long. The Infinity Wave is a full-length wave-shaped unit that’s able to provide more cushioning to the foot. It handles all phases of the gait cycle, thus ensuring that each step is well-supported, from the foot-strike to the toe-off. The Cloudwave technology ensures smooth and well-rounded transitions through the gait cycle. Basically, the Wave in the mid-sole now has a convex geometry, which enables the platform to accommodate the foot-landings and takeoffs with ease and finesse. The U4icX Strobel Layer is a soft section underneath the sock liner. It adds a bit more cushioning and comfort for the underside of the foot. A foam insole has been added for the benefit of the underfoot. It can be removed or replaced with a new one, depending on the preference of the wearer. AIRmesh is the material used for the upper unit of the Mizuno Wave Prophecy 6. This material accommodates airflow, thus ensuring ventilation for the foot of the runner. Stitched-on overlays provide structure to the upper unit. They also help the rest of the upper fabrics when it comes to hugging the foot because they’re directly connected to the lacing system. The upper unit has been engineered with the DynamotionFit, a 3-panel construction that makes the entire cover system more capable when it comes to accommodating the shape and the movements of the foot. Essentially, it makes the upper blend more seamlessly to the particular runner that’s trying out the shoe. The breathable fabric lining makes the interior sleeve soft and smooth. It also maintains ventilation, which is an important feature in this shoe. The padded tongue and collar help in providing some cushioning to the topmost dimensions of the foot. They also prevent any accidental shoe-removals.